(Bloomberg) — Monthly casino revenue in Macau fell for the first time in more than two years as China’s weakening economy kept high rollers away from the world’s largest gaming mecca. Gross gaming revenue in Macau fell 5% in January to 24.9 billion patacas ($3.1 billion) from a year earlier, according to data from the Gaming Inspection & Coordination Bureau. The decline was not as steep as the median analyst estimate of a 9% drop. The Bloomberg Intelligence index of Macau gaming stocks rallied after the news with a gain of as much as 0.8% that reversed a decline at the opening in Hong Kong. China’s trade tensions with the U.S., coupled with the Asian country’s cooling economy, contributed to ending a 29-month growth streak in the Chinese territory whose $38 billion gaming industry is far larger than that of Las Vegas. Casino revenue in Macau is expected to decline this year as nervous Chinese gamblers stay away from the tables. “The revenue drop in January reflects the continuous weakness of the business from high-stakes gamblers who are holding on to their money more tightly amid China’s economic uncertainties such as the trade war,” said Bloomberg Intelligence analyst Margaret Huang. 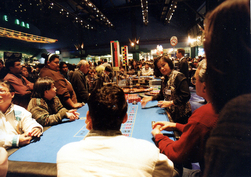 The industry is closely watching the high-roller segment. Wynn Resorts Ltd. reported fourth-quarter revenue and earnings that were stronger than expected, attributed to improved business in December. 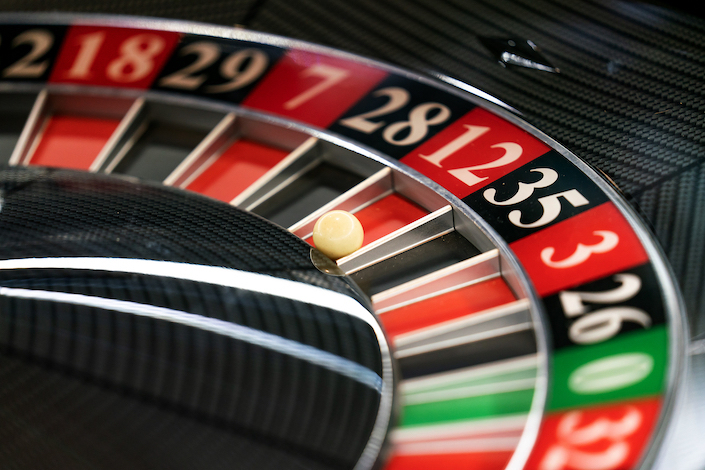 The high-roller business is volatile, however, and remains at relatively low levels. Wynn Macau Ltd. led the gains Friday, rising as much as 3.2%, while Galaxy Entertainment Group Ltd. gained as much as 1.7% in Hong Kong. 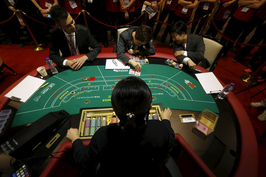 The timing of this year’s Lunar New Year didn’t help Macau’s monthly casino takings either. A few weeks of a marked slowdown typically precede the holiday. Those weeks of lag showed up in the January numbers, setting up a difficult comparison against a relatively strong year-earlier period. Now all bets are on February. Next month’s receipts, which will reflect the lunar holiday, are expected to grow 5%, according to a survey of analysts compiled by Bloomberg. Lawrence Ho, chief executive officer of casino operator Melco Resorts & Entertainment Ltd., said last week that the concerns about Macau are overblown. With all of the casino operator’s hotel rooms at its three properties all sold out, Ho said he expects a booming lunar New Year holiday. Wynn’s top chief took a cautious tone after the earnings beat.